A D.C. judge has set a court date of April 17 in the assault trial of Chris Brown, who is accused last fall of hitting a man outside a downtown hotel last fall. Lawyers for the Brown attended a hearing Thursday to determine a date the trial. Brown, who was not in town for the hearing, is facing a misdemeanor assault charge. The R&B singer and a bodyguard, Chris Hollosy, were arrested in October after a 20-year-old Greenbelt man said he was struck outside the W Hotel near the White House. The man had allegedly tried to get in a picture Brown was taking with two other people. According to a police report, Brown told the man, "I'm not down with that gay [expletive]" and "I feel like boxing." The victim received treatment for his injuries at a local hospital and was released. He told NBC Washington that he suffered a broken nose. Outside court the Monday after the incident, a friend of Brown's uncle said that he didn't believe the claim that Brown was responsible. "I don't believe it happened the way they said it happened," said Tommy Sanders. "We'll find out. But once you have somebody who is protecting you, a true and real protector will go the extra mile." 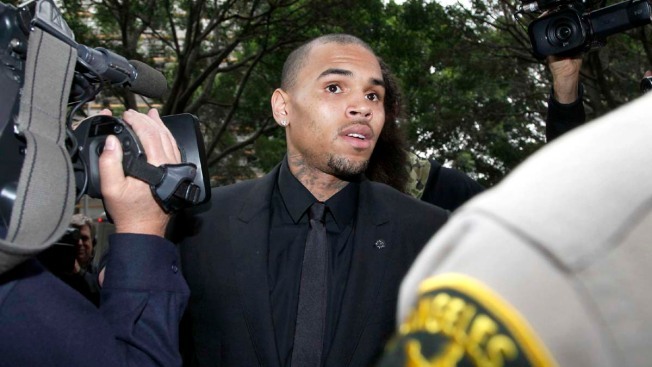 An attorney for Chris Brown said Thursday that surveillance video the prosecutors have shows nothing. "There's nothing there," the attorney said. At the time of Brown's arrest, the Grammy winner was on probation in California for a 2009 attack on singer Rihanna, his then-girlfriend. He was later ordered back to three months of rehab. Brown last appeared in court in Washington in January. At that hearing, one of Brown's lawyers told a judge that Brown had rejected a plea deal.